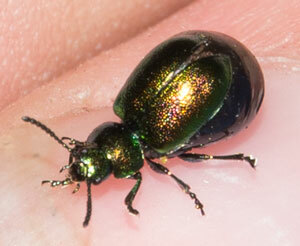 Green Dock Beetle (Gastrophysa viridula?) photographed 27 July 2013 by B Crowley. Id by Richard Comont. Green Dock Beetle (Gastrophysa viridula) – female laden with eggs.